Anna....would something like this work for a meeting? I could use that recipe. Please. Anna﻿....would something like this work for a meeting? I don’t know. There’s not much that wouldn’t work with this crowd. 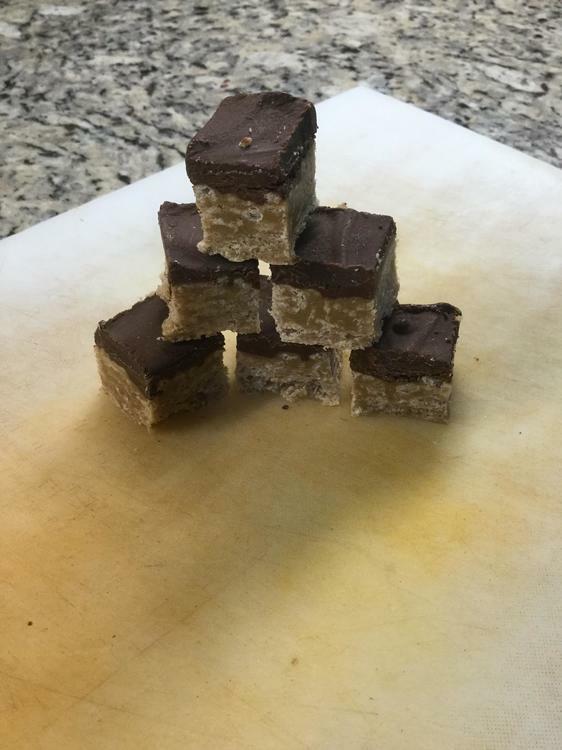 I have never made a no bake confection but there’s always a first time. Thanks for thinking of me. Some days I need easy! bring the karo and sugar to a boil; take off heat and add the peanut butter. Stir/combine. melt the chips together and spread on top, let cool. I've used a combination of dark chocolate and milk chocolate to great reviews. It has been a while due to vacations both mine and my son-in-law’s but today I decided it was time to get back in the saddle again. Nice thought. No white sugar. Refused to be defeated and found a recipe from Land O Lakes that doesn’t require any white sugar. 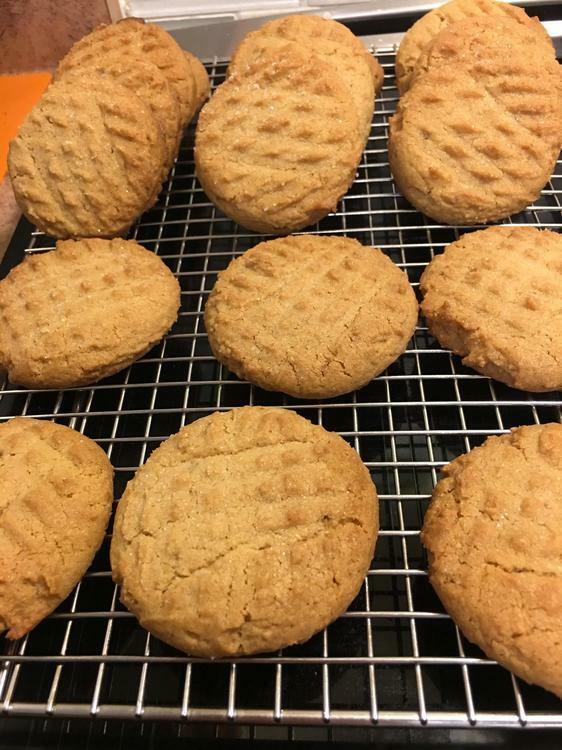 Plain peanut butter cookies. 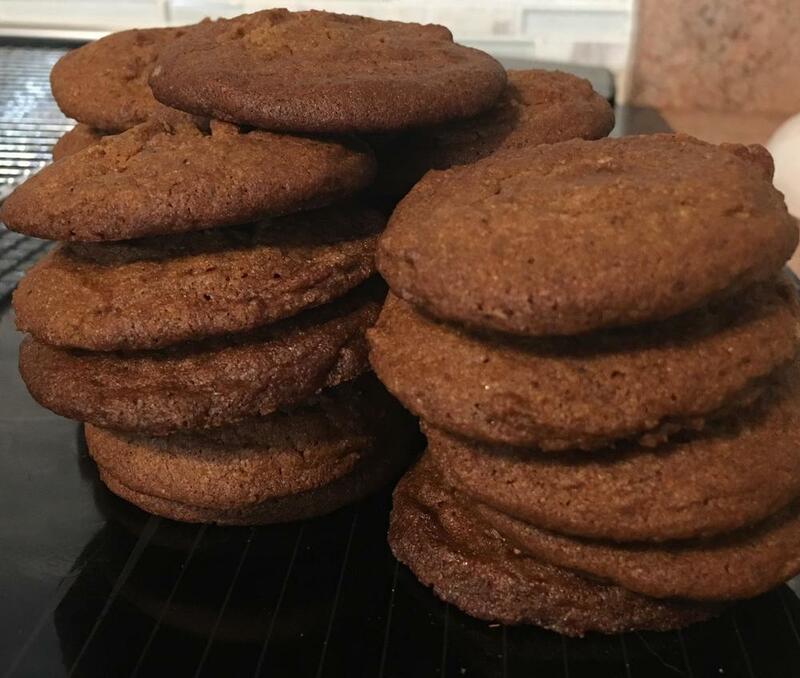 Dorie Greenspan’s Double Ginger Molasses Cookies. Since my food stylist is on vacation I thought I would take to heart the observation made earlier in another context by @Chris Hennes— choose the most attractive specimens and only photograph those. Out of respect for the recipe I am going to call these “salted chocolate chip thingies“. 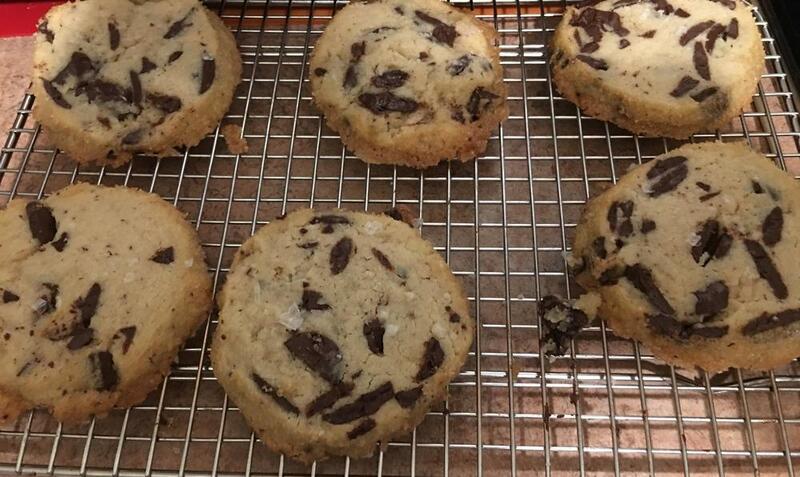 They were supposed to be the much celebrated recipe for Salted Butter and Chocolate Chunk Shortbread cookies from Alison Roman’s Dining In. Despite much help from @blue_dolphinon how to cut the rolls without the cookies crumbling, when I went to brush them with the egg before rolling them in the sugar I realized I had put the egg into the dough! Damn. Even as I read the ingredient “one large egg, beaten”, I wondered why you would beat an egg that you were going to beat when you added it to the dough anyway. But I added it, as one does, to many cookies recipes when the butter and sugar had been creamed. They are still tasty but certainly not what they should be and they are rather delicate. Nevertheless I expect them to disappear in short order. Omg those things are good. They aren’t crumbly. They are perfect. 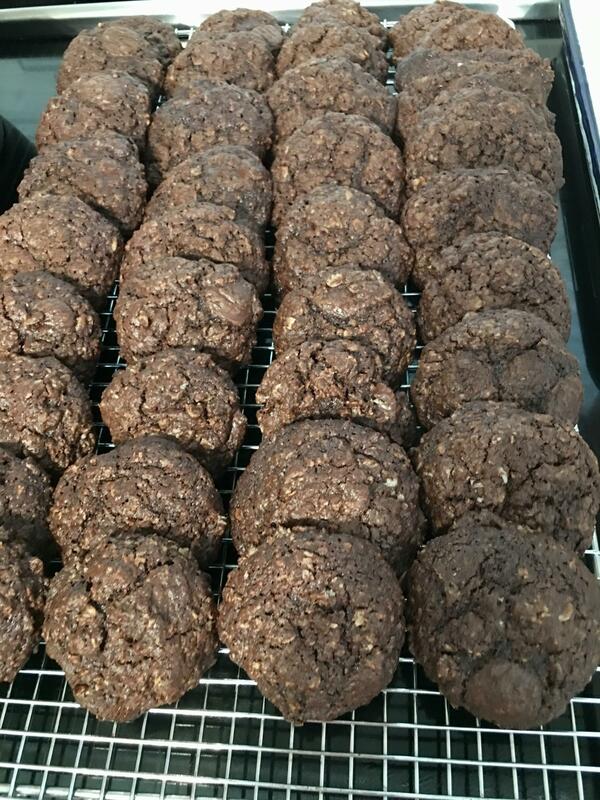 Johnny Iuzzini’s Gluten-free Chocolate Oatmeal Chunkers. More Spiced Wafers. I followed @blue_dolphin‘s method and reduced the size of the cookies using approximately 15 g of dough per. I got 47 cookies from my batch. Here . I understand the rolling in the powdered sugar before baking. I know there are chocolate crinkle cookie recipes that use the same method. 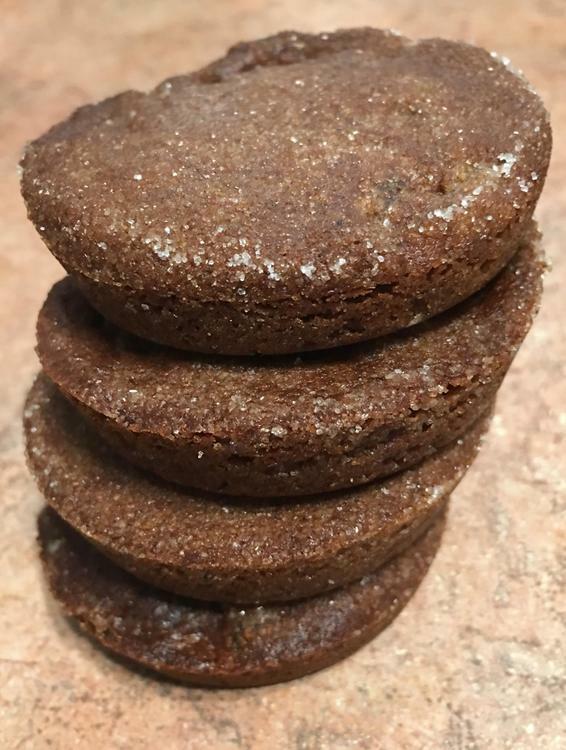 After baking, the contrast of the chocolate and the white of the cracked powdered sugar is part of the "charm" of the cookie. Using this same method for a white-powdered-sugar-on-blonde cookies doesn't strike me as contrast-y enough so it's an odd method to use. As for the "Key Lime Pie" flavor...at least they tasted the citrus, though erringly so. I wouldn't consider it a fail. Just unexpected results. Funny how the world works. I saw a box of these in Wawa last night. First time I've ever noticed them. 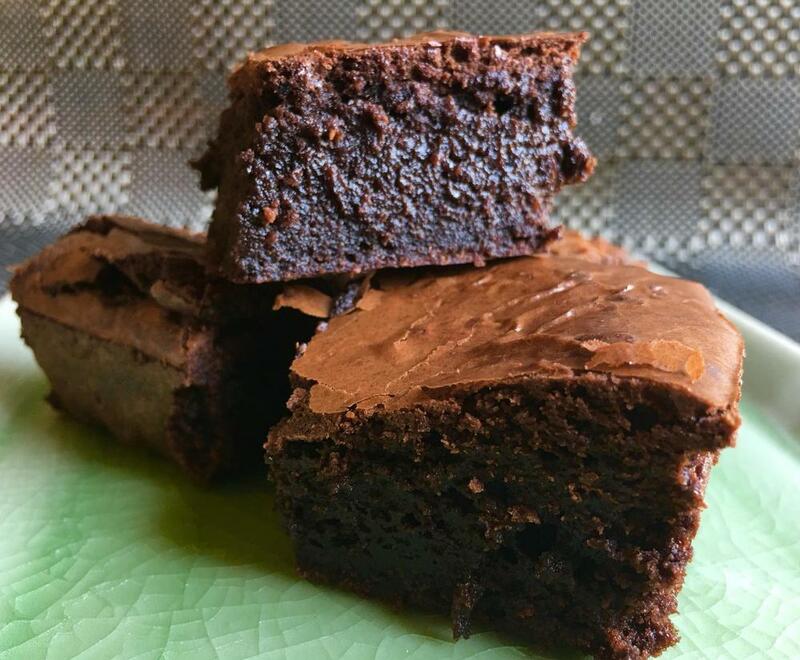 Classic brownies from The Artful Baker. I used black cocoa powder only because we were discussing it on another thread. My granddaughter has declared these the best brownies ever. Not being a connoisseur I have to take her word for it. She will get one or two if her dad is generous and he usually is. Not my proudest achievement in terms of baking but they’ll probably disappear anyway. This is the recipe I used. I wanted to make cookies that used coconut but were not macaroons. I recall a small coconut cookie that I used to buy for my husband and I was hoping to imitate that. These are huge and thin. I should have included something to indicate scale! 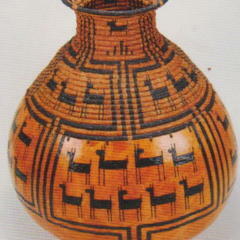 Some are 4 inches in diameter. I was hoping for something closer to 2 1/2 inches. Back to the drawing board. The Dare Breaktime coconut cookies approximate the ones I recall at least visually. I'm guessing the butter is what is making them spread so much (a Land'o'Lakes recipe so it's no surprise they're using two sticks). You could try adding more flour so the spreading would be lessened or forget the logs and use a small cookie scoop and put them on a cookie sheet and freeze them for a bit before baking to see if that slows the spreading down. They sound delicious though for a "Houston, we have a problem" cookie. I'm betting they're tasty even if not what you were shooting for. 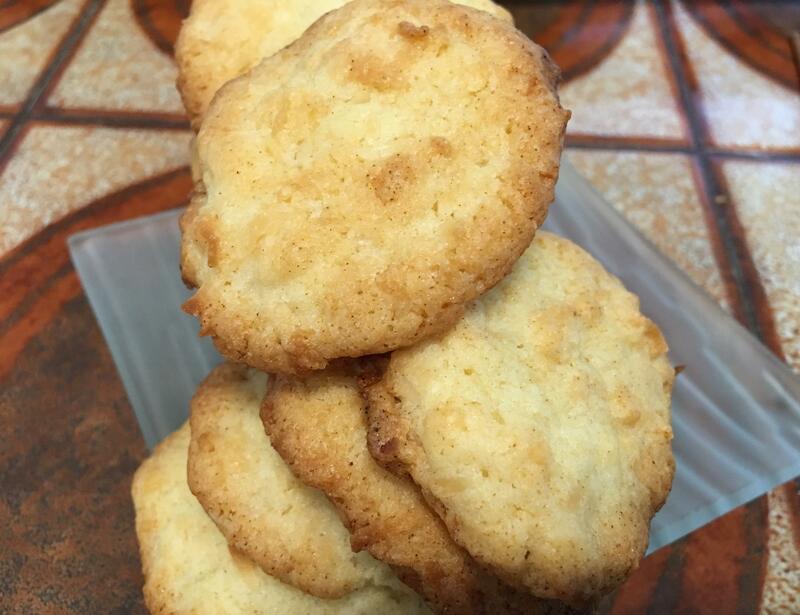 I'm not familiar with the Dare Breaktime coconut cookies but these are the coconut cookies I make when I'm going for a tasty not macaroon-ish coconut cookie. They call for baker's ammonia (I've read baking soda can be substituted, haven't tried it myself to compare the results) and I usually use 3/4 cup each shortening and butter instead of the 1 cup shortening and 1/2 cup butter called for. Thanks @Tri2Cook. I will definitely add them to the rotation. I think I even have some bakers ammonia around here somewhere. My first attempt was not particularly successful. That was probably my own fault. 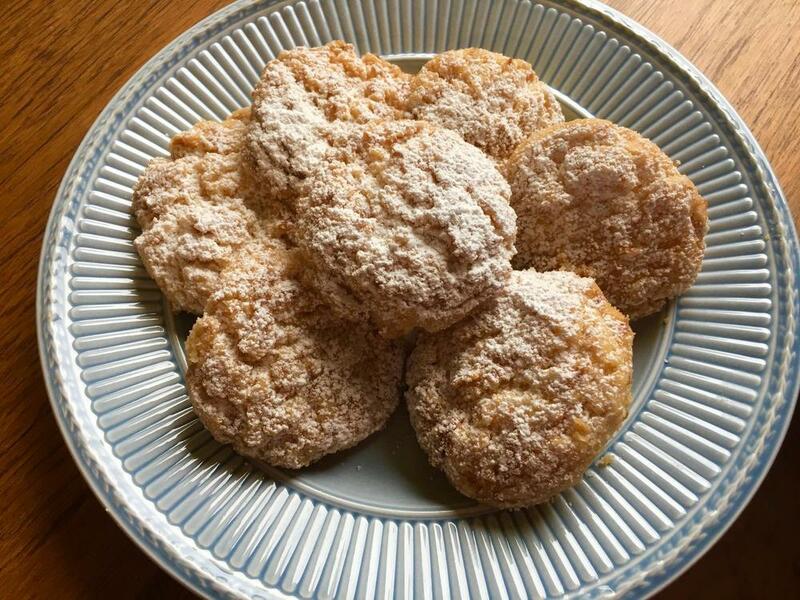 John had said that sweetened coconut was not available in South Africa so that his mother made these with unsweetened coconut. Not having any unsweetened coconut in the house I decided to simply cut down on the sugar from one cup to 2/3 of a cup. I was able to determine from the reviews that the 1 cup flour large probably indicated a mounded cup of flour. There is nothing in the recipe to indicate doneness other than to bake for 12 minutes. My first batch came out looking like anaemic, mini drop biscuits. They barely spread at all. I attempted various things to improve the outcome including sprinkling coconut on them baking them much longer then indicated. But all in all they were disappointing in both taste and appearance. This time they spread appropriately and I baked them until they had some colour. This meant increasing the baking time by three minutes. The other modification I made to the recipe was to add 1/2 teaspoon of almond extract. 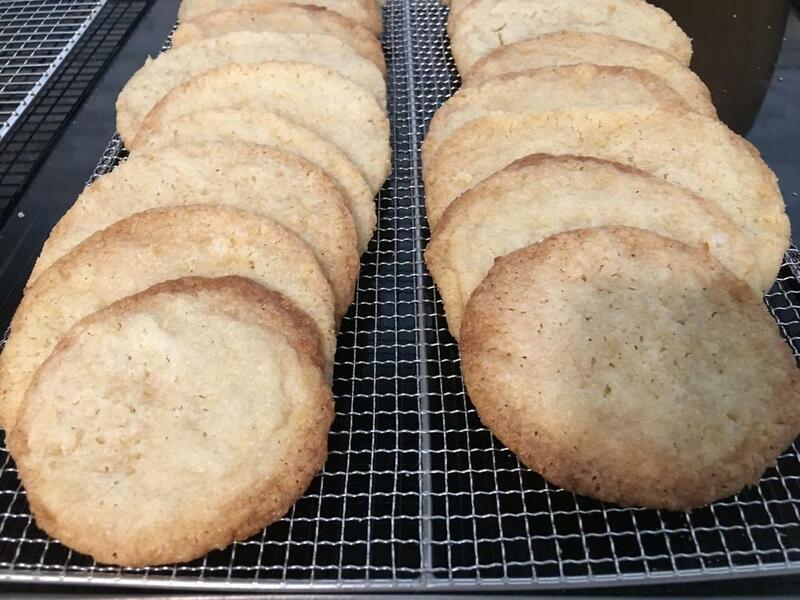 These are much closer to my imaginary coconut cookies. Next time I will try those recommended by @Tri2Cook. OMG. These are not the cookies I was searching for but my oh my I am very glad that I was nudged in their direction! I used bakers’ ammonia and the modifications that @Tri2Cooksuggested. I also converted the recipe to weights and used up all the coconut I had on hand which was a little more than was called for in the recipe. I don’t think it did the least bit of harm. I want to rename them “Clouds”. They look so substantial and yet they just melt when you bite into them. I thought about it a bit too late but when I make them again I think I will boost the flavour a bit with either some almond essence or perhaps some coconut essence. I find only coconut macaroons really carry much coconut flavor. Many thanks to everyone who helped with this coconut question and especially the kind member who sent me all the coconut. I still haven’t found the cookie I’m looking for but I don’t know that I care anymore. I do know that I am happy not to bake another coconut cookie for quite some time. The recipe claimed it would yield nine dozen cookies. I didn’t get quite that many. I’m guessing about 70. Probably I made the cookies a little larger than I should have. I don’t think it’s going to be a problem. @Anna N Those really look more'ish to me! I am sure the vultures at the office will get stuck into them and polish them off with relish! I add coconut essence to all my coconut baked goods. If I make a coconut cake, I want it to taste like COCONUT - not a yellow cake with vanilla icing with some coconut pressed into the icing! Unfortunately my teeny tiny bottle of coconut essence had simply evaporated into thin air. Would you be willing to share your version of the recipe, please? Happy to share the weights & proportions. What sort of coconut did you use? Sweetened flaked? Something else?